After his divorce, Wayne Hammond hesitated to make anyone the second Mrs. Hammond. Topping the list of the women he shouldn't pick is Maggie Harrison Sinclair. Maggie has already left Tucker, Montana, once. She's back only to lick her wounds and figure out her next step. Not exactly the ranch-loving, stay-at-home wife and mother that Wayne has always wanted. But once Wayne and Maggie cross paths, the impossible-to-resist rancher and the bright-lights-loving woman succumb to their hotter-than-heck attraction, resulting in an even bigger complication. 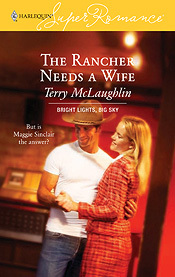 A former drama teacher, Terry drew from several backstage memories as she wrote about Maggie Sinclair's efforts to stage a theatrical revue in The Rancher Needs a Wife. Clearing a neglected space, dealing with unstable sets, sewing costumes, rehearsing in the school librarymuch of the material for the book came from Terry's actual experiences. "...full of smart dialogue and great characters." "...an enchanting novel that provides everything we look for in a great romance." "Heartwarming and poignant...have the tissues handy just to be safe." "Look for more from this author as each book of hers gets better than the last."